Are you stuck in the elimination phase for the holidays? Don’t panic! Managing the Low FODMAP Diet during the holiday season can be intimidating. Especially if you’re new to the low FODMAP program. But, with some expert planning, you can celebrate with confidence! 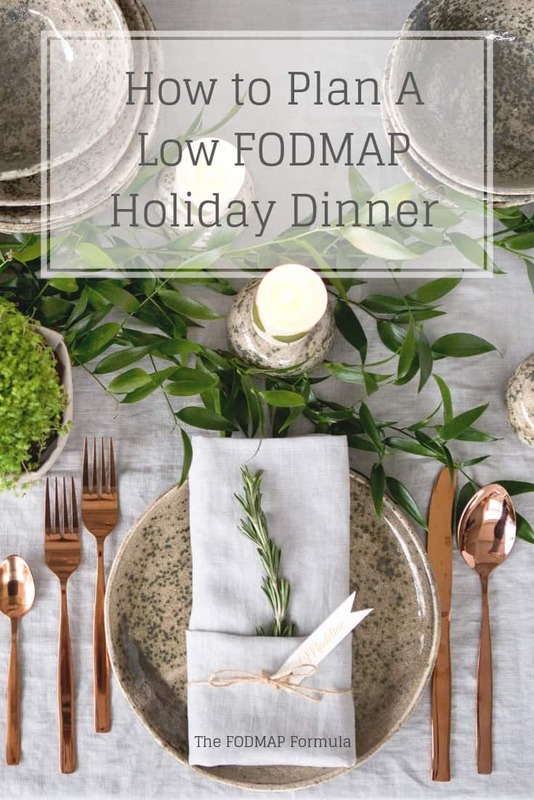 Check out the article below for tips and tricks on how to plan a low FODMAP holiday dinner! This might seem a little obvious. But, the key to a low FODMAP holiday dinner starts with choosing the right recipes! This means physically sitting down and finding holiday dishes that will keep you on track. When my husband and I are planning any multi-dish event, we like to start by figuring out how many dishes we want to serve. This includes thinking about how many people are coming and if they have dietary requirements of their own. As well as how many dishes we want to serve for each course. Once you know how many dishes you’re hunting for, block out time in your calendar to find low FODMAP recipes. If you need help finding ideas, make sure to check out my recipe section as well as the FODMAP Monash blog! 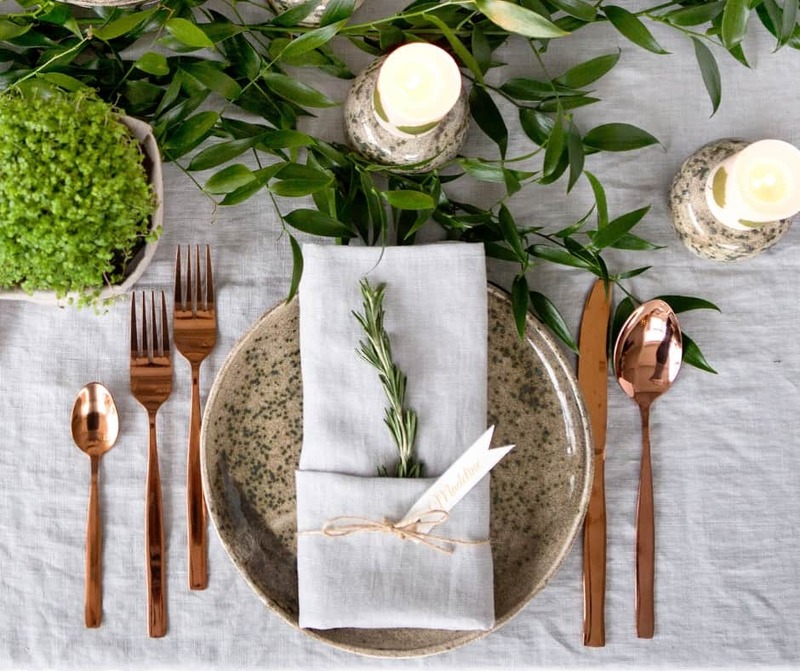 Remember, you can still serve high FODMAP dishes to your guests. The trick is to make sure there is always something low FODMAP available for you. And, that you’re thinking about dishes that may derail you in advance. For example, I always make sure my favourite dishes are low FODMAP (this includes things like gravy, mashed potatoes, dessert, etc.). That way I’m not tempted to jump off the bandwagon when the brownies make their rounds. Think about what holiday trimmings you can’t live without and do your best to keep them low FODMAP. Once you’ve picked out your low FODMAP recipes, it’s time for a little FODMAP math! Start by listing each of your recipes by title. Then, go through the Monash app and write down all the FODMAPs you find (including their serving size). For example, these low FODMAP green beans use both green beans and almonds. Green beans are low FODMAP in servings of 86 g (or 12 beans). Serving sizes of 125 g or more are high in the polyol sorbitol. While Almonds are low FODMAP in servings of 12 g (or 10 nuts). Servings of 24 g or more are high in galactooligosaccharides (GOS). For my FODMAP math, I would write 1 serving sorbitol + 1/6 serving GOS beside the recipe title. – Calculate the FODMAP servings based on one serving of the recipe. Repeat this step for each of the recipes you’ll be eating. I’ll explain how to use this information to manage your FODMAP load in the next section. Did you know green light items can stack up? That’s right! Unless Monash has specifically made a note that a food doesn’t contain any FODMAPs, even green light foods can push you over your FODMAP threshold. This is a phenomenon called “FODMAP stacking.” While it may not cause problems in your day-to-day life, it can be problematic when you eat multiple dishes in one sitting. Like, during the holidays. Are you panicking? Take a deep breath, friend! I’ve got you. Most IBS experts recommend using the 1.5 rule to manage your FODMAPs. This means you stick to 1.5 servings of any FODMAP group in one sitting (3 hours). Now that you’ve written down all the FODMAPs in your recipes, go through your list and match any recipes with ingredients from the same FODMAP group. You should have written the serving size of each ingredient beside the recipe title. Now add them up and see how much of each dish you can eat before hitting 1.5 servings. Write down your “safe” serving size beside the recipe. For example, if I had two recipes with 1 full serving of fructans per dish, I could either have 1 serving of one dish and half of the other. Or, I could have 2/3 servings of both. If I had three recipes with 1 full serving of fructans per serving, I could have 1/2 a serving of each, or, if I’m not excited about one of the dishes, I could skip one and split my 1.5 servings between the two dishes I like. When you’re working with multiple dishes (appetizers, main dishes, side dishes, desserts, drinks, etc. ), FODMAPs can add up pretty quickly! So, I try to make sure each of my courses has at least one dish with no FODMAPs if possible. If you need help managing your FODMAP load this holiday season, make sure to check out my new eBook: 12 Low FODMAP Holiday Side Dishes. Each of the recipes in the eBook features a food with no detectable FODMAPs. So, you’ll have a little extra space in your FODMAP load when dessert rolls around. Planning a low FODMAP holiday dinner doesn’t have to be scary! With some good planning and a little FODMAP math, you’ll rock your low FODMAP holiday dinner! Did you like this article? Don’t forget to share it! Together we’ll get the Low FODMAP Diet down to a science! P.S. Want access to bonus content, VIP discounts, and some fabulous freebies? Sign up for my mailing list below and you’ll get all these goodies and more sent directly to your inbox! How to Survive the Holidays with IBS Worried about keeping your IBS symptoms under control this holiday season? Check out these practical tips on preventing and managing common IBS symptoms. How to Relieve Trapped Gas While gas is a normal product of digestion, sometimes it can throw a monkey wrench in your digestive system. Check out this article for practical tips on letting it go this holiday season. How to Cope with IBS-Related Bloating Sometimes you can do everything right and things will still go wrong. I interviewed the experts for tips on coping with symptoms when our bodies feel out of our control.